Transferring media files from your smartphone to your desktop has become a pain nowadays. Most mobile phones today don't have straightforward mobile to PC Storage mode connection. You need to enable the Developer mode and even then I have seen that your PC won't detect the phone. A real pain to be honest with you. Thanks to the easy availability of interest today that you can use some cloud storage to keep it as a medium for the file transfer. However, then there are too many files like when you are changing your phone and want to transfer all your media doing the transfer with an intermediary in between will take too much time. There are a few apps that can do the task but most of them as not free except Resilio Sync (formerly BitTorrent Sync) which works great if you are okay with having an app on your phone to regularly sync your phone media with your desktop. However, many people including me like to keep our phone light and don't mind installing a software on our desktop which no doubt has much more space to handle applications that our phone. On such desktop application is ScanTransfer. This requires no app installation on your phone and uses your Wifi to act as a bridge between your desktop and phone. The desktop is assigned a free local IP like 192.168.0.102 and since your phone is also connected to the same Wifi, it can directly communicate with the desktop to transfer whatever files it feels like. And the best part is that it is completely free to use. I will be honest, I was a little concerned with the freeware status of this application in case it is transferring my personal data to some other server on the internet. I gave the software a try and used some of my own methods to check if any network data is flowing while the application is installed and found no communication happening with the outside world. So it did check out on that front. Install the application from the link given above. Once installed, launch the application. The desktop application will show you a QR code as shown above. 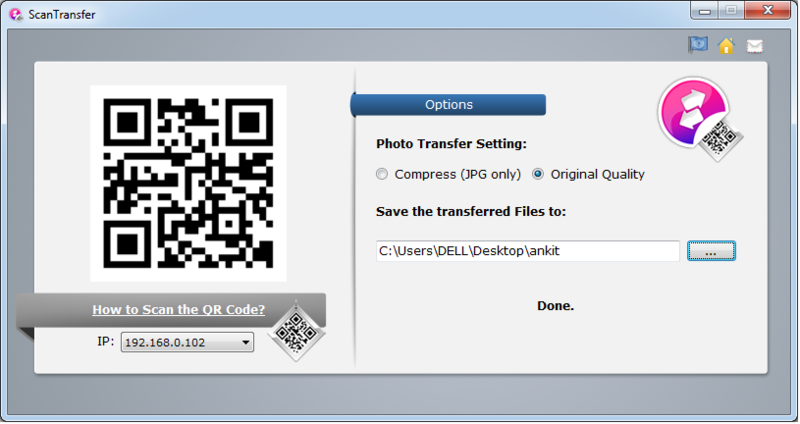 Open your mobile phone camera or Twitter/Facebook camera and scan the ScanTransfer application QR code. You will get a URL which will consist of the IP address that is being shown in the desktop ScanTransfer application. Click on the URL, your phone web browser will open showing a page like below. Click on the +Select Files button. Select the files to transfer. Long press to select multiple files. 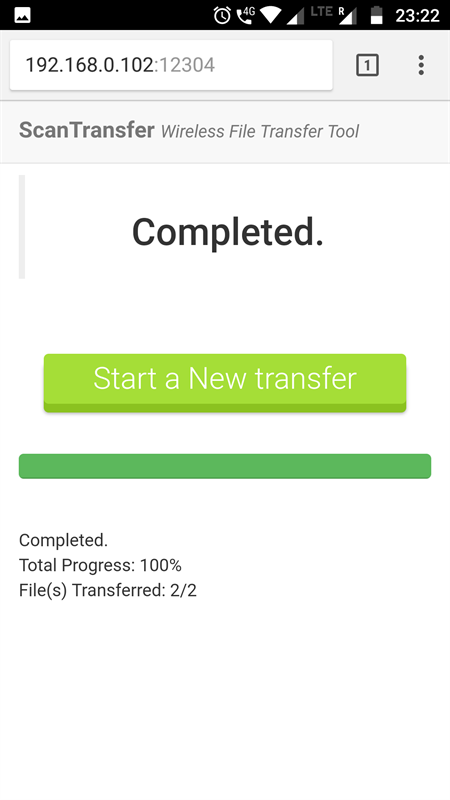 Click on Open button to start the transfer. The files would be transferred within seconds on your desktop. You can choose in which desktop folder you want to save the files. You can also change the IP on which this transer takes place by using the dropdown in the desktop application. ScanTranfer is an amazing application which is completely free without any premium version in the market. That means no limitations on the number of files, transfer speed, multiple parallel transfers or file types. Since the communication is completely on the LAN there is no issue of privacy being compromised. It is a simple application to use which is fast and efficient. Highly recommended for all. Thanks for the helpful guide for transferring photos from the mobile phones to PC for saving. 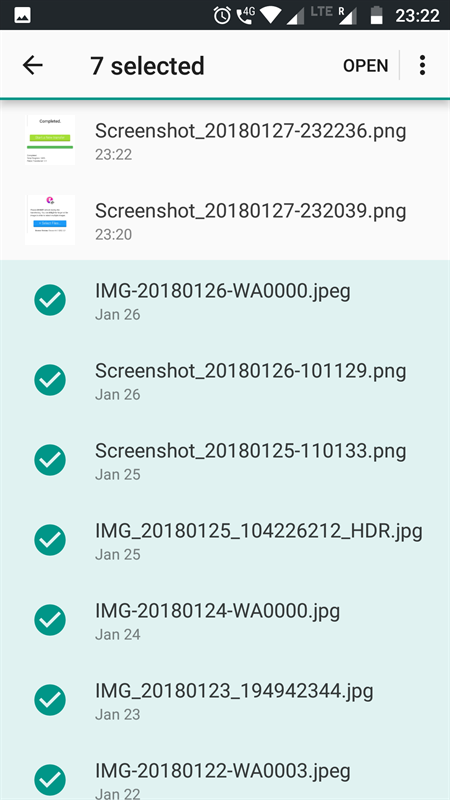 This is a very easy way to save the photos.